Combines a system of photo-eyes and discrete electronic logic control without the use of PLC's to provide "intelligent" zero-pressure control. This system works on a variety of conveyor models, and allows you to customize how the product is accumulated and released from the conveyor. EZLogic®, or Electronic Zero-pressure Logic, is a method of zero-pressure control that combines the sensing accuracy of photo-electrics with discrete electronic logic control without the use of a PLC or pneumatic logic components. This system provides all the "intelligence" needed to accurately control the various functions of zero-pressure accumulation on a variety of conveyor models. Reduced noise, higher reliability, higher throughputs, and ease of maintenance are just some of the advantages of the EZLogic® system. A horizontal plastic belt curve conveyor which is normally slave driven from the Model CCEZ straight conveyor for accumulating 12 and 24 packs of canned beverages where high speeds and large through-puts are required. A horizontal plastic belt conveyor designed for accumulating 12 & 24 packs of canned beverages where high speeds and large through-puts are required. Conveyance and accumulation methods provide ability to move and control cases at higher speeds with no product marking. No rollers results in no lithographic buildup, and minimal components lend to quieter operation. This plastic belt conveyor handles footed pallets, slip sheets, unitized loads, etc.- items normally can't be conveyed on rollers. The PLEZD provides Zero Back Pressure accumulation, reducing the possibility of product damage. Model 190-NSPEZC is a horizontal live roller curve conveyor designed for Zero-Pressure Accumulation of product in conjunction with the straight 190-NSPEZ Conveyor. Positive braking in each zone reduces the possibility of damage to fragile items during accumulation. Singulation feature allows products to be removed from any location on the conveyor. Hytrol Model ABEZ is a horizontal live roller conveyor designed for applications that require accumulation of products without a build-up of line pressure. 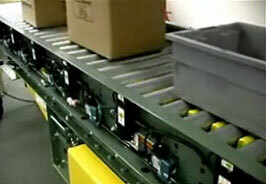 Singulation feature allows products to be easily removed from any location on conveyor. Each zone extracts power from a flat drive belt that runs the entire length of the conveyor. When a product is stopped, a sensing eye is activated, sending a signal to the trailing zone. When the next load moves into this zone, the drive belt is lowered away from the tread rollers causing the product to stop until the product is released. When any product is removed, all others behind this zone will move forward in sequence.